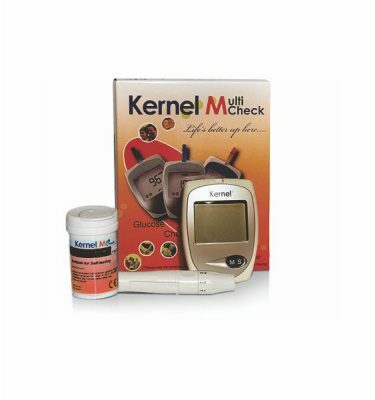 The self-testing Kernel MultiCheck™ Uric Acid Multi-Function Monitoring System is designed healthcare professionals and persons with gout to measure uric acid values in fresh capillary wholeblood from finger stick quantitatively. 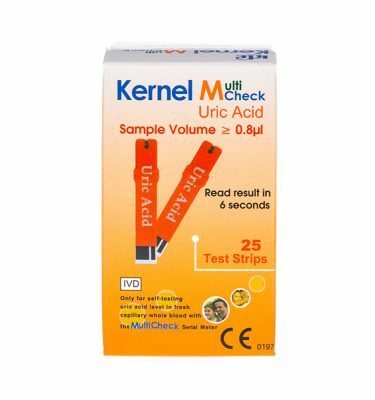 Kernel MultiCheck™ Uric Acid Meter Will Help You Control Your Gout Buy Monitoring Yout Uric Acid Levels. 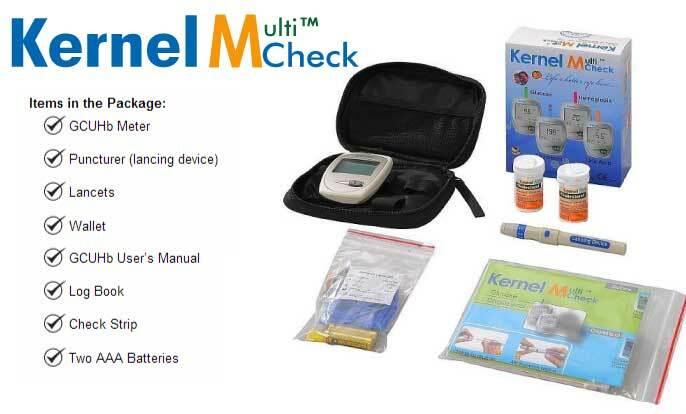 The self-testing Kernel MultiCheck™ Uric Acid Multi-Function Monitoring System. The self-testing Kernel MultiCheck™ Uric Acid Multi-Function Monitoring System is design for vitro diagnostic use only (external use only). 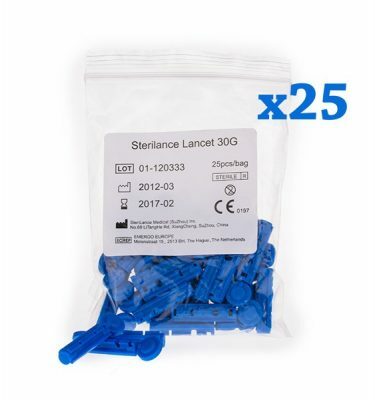 The system is for healthcare professionals and persons with gout to measure uric acid values in fresh capillary wholeblood from finger stick quantitatively. Frequent monitoring of whole blood uric acid is an adjunct to the care of persons suffering with gout. 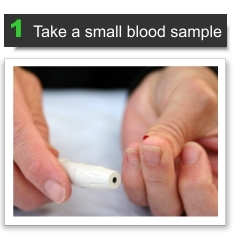 Simply apply a drop of blood to the test strip, the test result will be displayed on the screen after 20 seconds for uric acid. 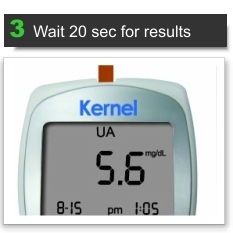 The Kernel MultiCheck™ GCUHb meter can only be used with Blood Glucose, Cholesterol, Uric Acid and Hemoglobin Test Strips. The use of any other test strips may give incorrect results. Before using the products to test your blood glucose, cholesterol, uric acid and hemoglobin levels, read all the instructions carefully. It includes all the information you need to know in order to o get the accurate blood glucose, cholesterol and uric acid readings. Do not change your medical plan without doctor’s approval.The GCUHb Monitoring System should not be used for the diagnosis of diabetes, hypercholesterolemia and hyperuricemia or for the test of newborns. Add a product to your cart by clicking “ADD TO CART” or get more info by clicking on the picture! These test meters are one of the best things a gout sufferer can do to help keep their gout in control. By checking your uric acid blood levels every couple of days or weeks you can keep a good eye on uric acid levels, all in the comfort of your own home. This is difficult to answer as everyone will have different objectives. The meter should be used as a guide showing you if your uric acid levels are going up, down or holding level over time. Plotting the readings on a graph can help with this. I personally regularly check my Uric Acid levels, initially once per day (keeping a log of my food) and now once or twice a week – more if I feel the Gout “tingle”. I occasionally check my Cholesterol and Glucose levels. How easy is it to use the meter? There is a very comprehensive instruction booklet, as well as our own notes, pictures, Instruction video. and tips. 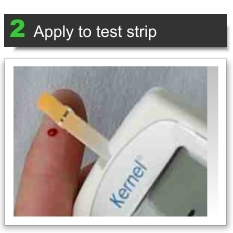 After a little practice (use the cheaper Glucose strips) you soon get used to getting the right amount of blood into the test strips, and it becomes second nature.